We couldn’t be more happy to announce our first software development in Virtual Reality (VR). We have done our first demonstration with models of the ExoMars satellite, Schiaparelli lander and Juice mission, and it was absolutely successful. Virtual Reality is a new technology that allows us to travel to any place (real or not) without even moving from the sofa. For that, we just need VR glasses, that display the 3D world in front of us, and in some occasions 4D sensory elements. Our demo app is compatible with HTC VIVE, Oculus Rift and Samsung Gear VR glasses. Once you put them, you will be teleported to a scenario where you can move around and examine different spacecrafts. We choose to start with the ExoMars satellite, Schiaparelli lander and Juice mission. ExoMars is a joint endeavour between ESA and the Russian space agency, Roscosmos. The first part of the ExoMars programme, Exomars 2016, consisted of the Schiaparelli lander and the Trace Gas Orbiter (TGO), usually just called ExoMars satellite. 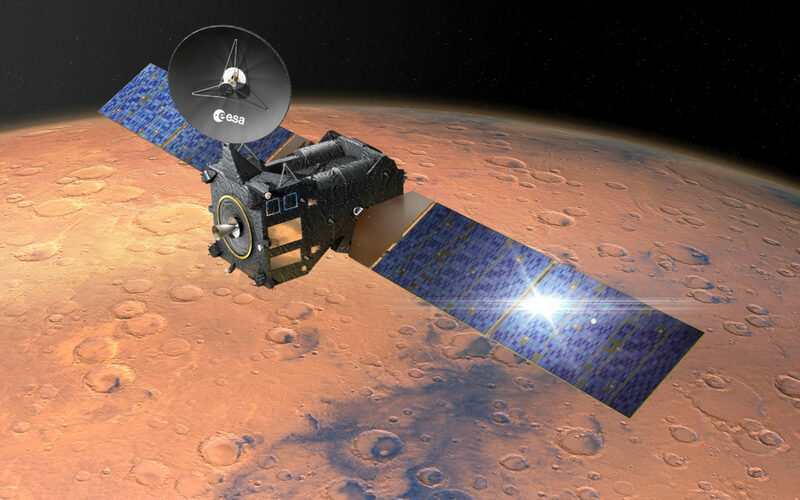 ExoMars’ main goal is the search for life in Mars. Since 2016, TGO is looking for evidence of methane, which could be evidence of biological activity. Unfortunately Schiaparelli’s landing went wrong and it couldn’t perform its task.